Lurk (intransitive verb): to move furtively or inconspicuously. Middle English, akin to Middle High German luren, to lie in wait. I do a lot of this. Lurking, that is. At night. And I have the images to prove it. I honestly don’t think most people SEE at night. Otherwise, there would be crowds wandering deserted streets at night, exclaiming over the neon of an isolated roadhouse, or trekking mountain paths in the moonlight, marveling at the interplay of light and shadow in a moonlit glade. 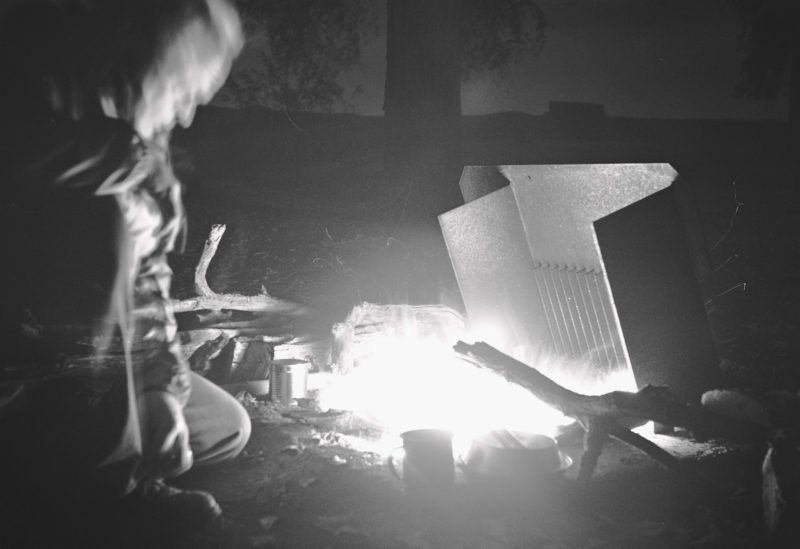 Night brings out magical effects that most of us miss. Recently, I went for a walk at midnight in an aspen grove in Colorado. By day, this path wove through a pleasant but not particularly remarkable stand of trees bordering a wetland south of Denver. By night, as I walked along with the moon at my back, each tree glowed with a silver luminosity as if lit from within. Returning, the shadowed back of each trunk thrust darkly upward against the moonlit meadows. Each grove became its own composition of light and shadow, line and shape. Night, however, is also the time of furtive assignations, secretive errands, and night stalkers. Photographing after dark, one becomes part of this world, with its sense of threat and mystery – and I love it. I feel at one with a long line of dark-coated, camera-toting figures lurking in corners, waiting for the mist to veil street lamps and car headlights. Peering through my viewfinder at an abandoned warehouse, I feel Brassai standing behind me, with his Voigtlander Bergheil slung over his shoulder and the sounds of 1930s Paris filtering through the fog. 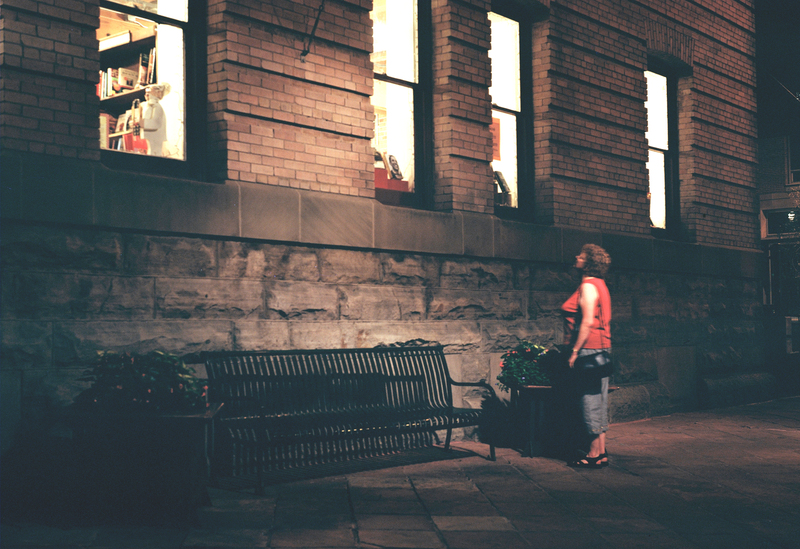 Night photography requires dedicated, sophisticated, and well-planned lurking. One must haunt lonely alleys in the bad parts of town, street lamps in lonely alleys, the “Old Town” areas of many cities, and small towns in Kentucky at midnight. Being questioned by policemen is an occupational hazard, though most will dismiss you as a harmless eccentric when they see your camera and tripod– art is a socially acceptable form of lunacy. The rewards are worth it, however. 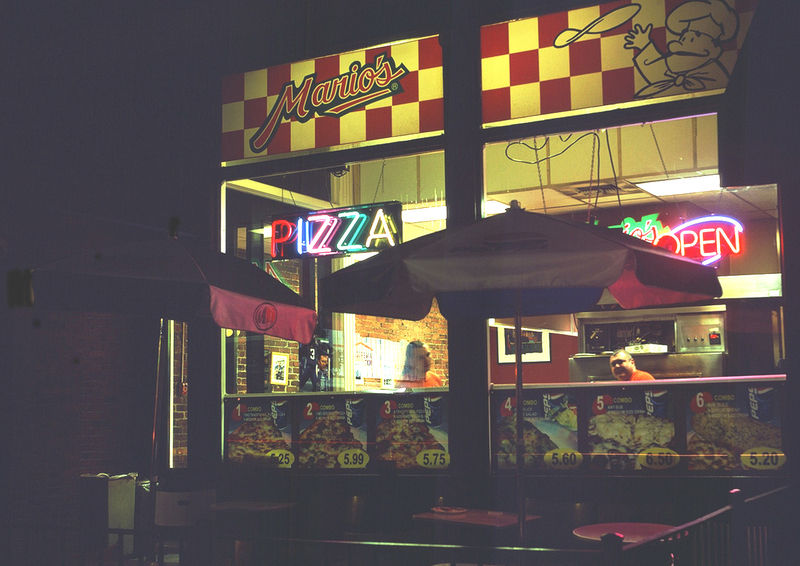 With my 1928 Kodak, I captured two bored pizza jockeys at an all-night pizza stand late one night in Seattle’s Pioneer Square. If you really want to do good lurking, however, the best place is a graveyard. Not only can you carry on the tradition of the legions of fine skulkers in the shadows of film and fiction, if there is any source of illumination, you may scuttle away into the darkness with some striking images. St Mary’s historic Anglican Church in Metchosin, B.C. not only has a churchyard fill with pioneer headstones, it also has a perfectly situated spotlight illuminating the tombstones. 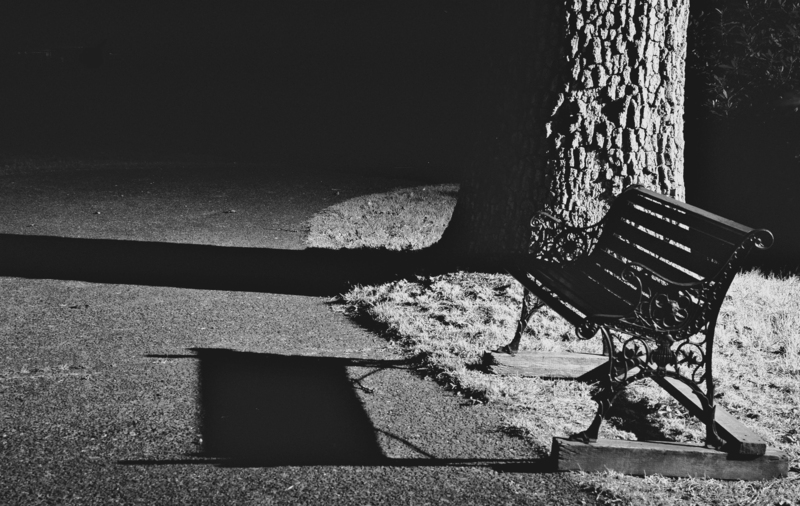 Meant to discourage vandals and beer-swilling teens, it casts a dramatic light over headstones, trees, and a quaint wrought iron bench. My favorite image came when I noticed my shadow falling in the stone. I initially struggled to maneuver around so that I could shoot the headstones without a shadow from either myself or my camera and tripod. This was almost impossible at many of the best angles. Suddenly, I saw my shadow fall outward between the stones, and that image capture circuit in my brain flashed on – make the shadow the image! 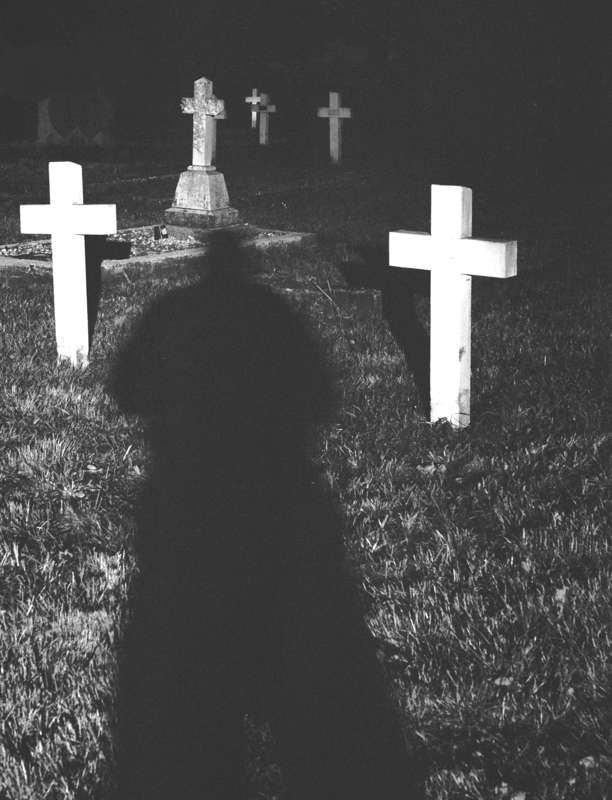 I stood over my tripod, superimposing my shadow over it, opened the shutter, and stood rigid for four minutes while the film recorded the tombstones disappearing into the darkness, my sinister shadow creeping between them. Of course, safety is important. Remember that there may be more efficient lurkers than yourself, and don’t take unnecessary risks. Some of the best images are found in dark alleys and less-traveled parts of the city. Explore these areas, but use common sense. Don’t dress expensively, and don’t be obvious about fancy equipment. Pepper spray is a good photographic accessory. Know where your car is and how to get back to it. Carry a cell phone and small flashlight. In some areas, consider staying in your car. I love these images. Next time it’s dark, don’t just head off to the grocery store- stop and look around, and maybe wander a bit. And if you notice a dark figure skulking about, check to see if it’s carrying an old Kodak before you whack it with your umbrella. “Shadow In The Graveyard”, absolutely brilliant! 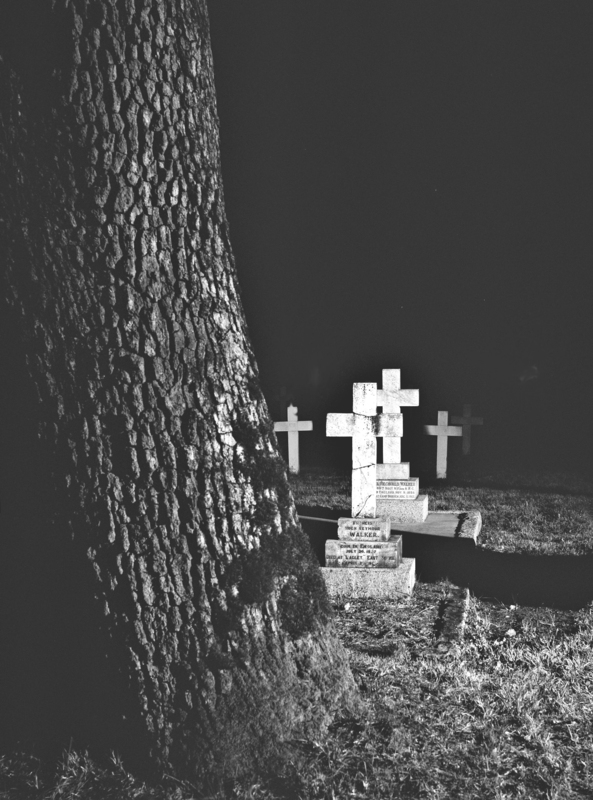 I also have graveyard photos, foggy days, near dark, unusual stones, but your shadow shot is absolutely intriguing. Without a doubt I’ll try to improve my graveyard shots, and, credit to you, will try to capture my own shadowy apparition among the stones. Won’t be easy, as our graveyard has no lights. But the full moon may work quite well as it rises low in the eastern sky. Thanks for your most excellent film discussions.